This tasty spinach-lentils curry is packed with vibrant spices, nutrients and bursting with flavor. It is cooked in 15 minutes using instant pot and is easy and quick enough one pot meal for a weeknight dinner. 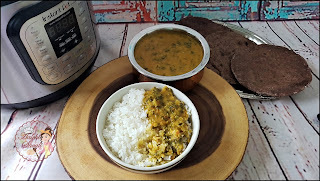 This is a very simple and the most healthy dal recipe you can make in a short amount of time. 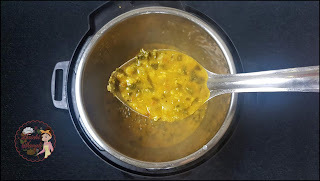 Split Pigeon Peas is traditional Indian dal used in a lot of recipes. Lentils are a versatile and nutritious ingredient. Lentils are relatively quick and easy to prepare compared with dried beans. Lentils are the perfect legume to eat in the summer in salads, spreads and as an item on a vegetarian dinner plate. Lentils and green vegetables are a hassle-free compliment to any meal. 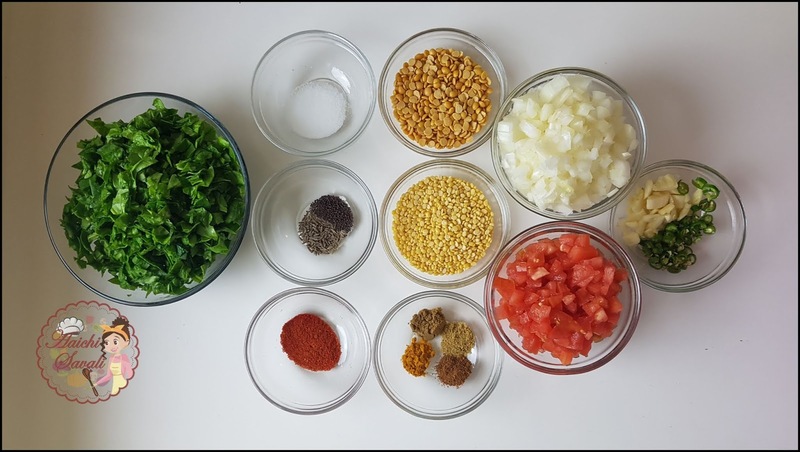 Lentils are nutty and earthy in flavor and have a high nutritional value that anyone can benefit from by incorporating this healthy legume into their diet. Addition of green veggies to the lentils increases their nutritional value. Unlike dried beans, lentils do not require soaking. Veggies are incredibly rich in nutrients and antioxidants, which boost your health and help fight off disease. Also, they are beneficial for weight control due to their low-calorie content. By making veggies a regular part of your eating habits, you'll significantly increase your intake of fiber, nutrients, and antioxidants. Eating enough vegetables is also associated with a reduced risk of heart disease and cancer, and may be beneficial for weight control. Precook lentils and keep them in the refrigerator for a quick protein source. Use lentils in place of beans in any recipe. Add lentils to any soup or stew recipe for extra nutrients and fiber and protein. Make a lentil dip by smashing cooked lentils with a fork and adding garlic, onion, chili powder, and chopped tomatoes. Make veggie soup: Soups are an excellent way to consume multiple servings of vegetables at once. Veggie noodles are easy to make, and a great way to get more veggies in your diet. They're also an excellent low carb substitute for high carb foods, such as pasta. Blend greens with a smoothie, make it for a refreshing breakfast or snack. Each Serving of Dal-Palak / Spinach-Lentils Curry Contains 130 Cal. Wash lentils and keep aside. Wash rice and add 1 ½ cup of water, salt ½ Tsp and keep aside. Turn on sauté mode of the instant pot and heat oil. 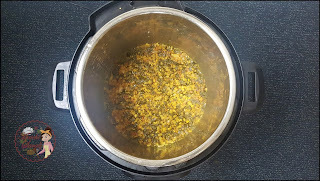 Splutter cumin seeds, mustard seeds and add green chilies, garlic. Now add chopped onions and saute and cook for 2-3 minutes. 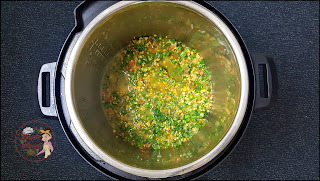 Add tomatoes, sauté for a minute and add all the spices (turmeric, garam masala, coriander powder, cumin powder, red chili powder), salt and mix well. Add spinach leaves, washed split mung dal and split pigeon peas dal and mix well. Add 1 cup of water to the pot and mix well and place rice pan with trivet. Cook on manual mode (Hi) for 7 minutes and followed by Natural Pressure Release (NPR) for 5 minutes. Release remaining pressure manually and open the lid. 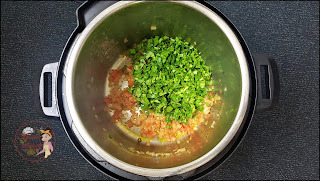 Turn on Saute mode of instant pot and add 1 Cup of water and cook for 2-3 minutes. Add lemon juice and mix well and serve dal-spinach hot with rice or with chapati, puri. Enjoy!!! You can use some other type of greens like fenugreek, fill leaves or kale would work well. 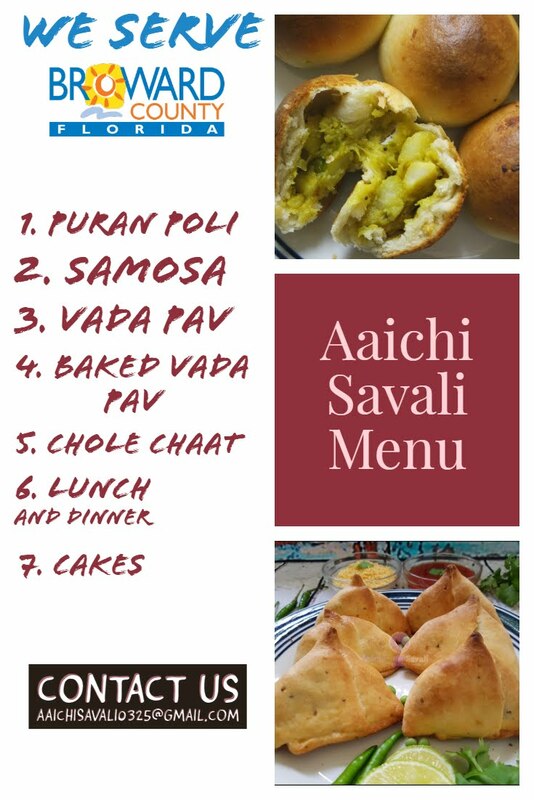 You can use red split peas or chana dal too, instead of pigeon peas or mung dal. Per serving contains 130 calories, along with 19.68 g carbohydrates, 5 g dietary fiber, 3.33 g fats, and 5.6 g protein. It is rich in dietary fiber and so help to reduce blood cholesterol. It is an excellent natural source of protein, folate, and manganese. The fiber in the diet helps to increase satiety and reduce appetite, giving a full feeling for longer. This can lower the overall calorie intake and ultimately aids in weight loss. The high fiber in lentils also helps prevent constipation and promote regularity for a healthy digestive tract. Eating spinach benefit eye health, reduce stress, and lower blood pressure levels. It's good to eat spinach-lentils curry for lunch and for dinner.